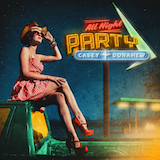 Almost Country Records/ Thirty Tigers releases Casey Donahew’s ALL NIGHT PARTY today. The full length album, produced by renowned producer Josh Leo, features ten new songs (nine written or co-written by Donahew) including the new single, “Kiss Me.” The video for the new song, directed by Evan Kaufmann and filmed on location in Texas, is set to World Premiere on CMT’s Artist Discovery platform today. Watch HERE. ALL NIGHT PARTY covers plenty of ground, touching on universal themes like true love, heartbreak, hard work, and partying hard when the work week is through. In a nod to his love of the cowboy life, Casey recorded “That’s Why We Ride” and “What Cowboys Do,” which are sure to become favorites among the rodeo circuit as well as riders everywhere. He taps into the “Pancho And Lefty” vein on “Josie Escalido,” a mariachi-infused tale about star-crossed lovers mixed up with outlaws, angels, and the law. Casey also gives a shout-out to a big portion of his fan base with “College Years,” a fun song co-written by Kip Moore. Of course no Donahew album would ever be complete without a nod to the wacky and fun White Trash set, so in the vein of his smash hits “Double Wide Dream,” and “White Trash Story,” he revisits that world on “White Trash Bay,” a thunderous tune celebrating a driftwood bar full of salty characters. With thirteen years of touring under his belt playing every kind of venue under the sun, “Country Song,” is a fitting autobiographical nod to Donahew’s high energy shows, his life on the road, and his devotion to the fans who follow him zealously and sing back every word to every song, night after night. The gamut of material ALL NIGHT PARTY is evidence of Casey’s desire to keep changing and growing as an artist, to give his fans the best he has each and every time out.